Extra large size, stainless steel case with 18K yellow gold bezel, silver dial, automatic winding mechanical movement with chronograph function, alligator strap with stainless steel and 18K gold deployant buckle. Water resistant to 100 meters (330 feet). 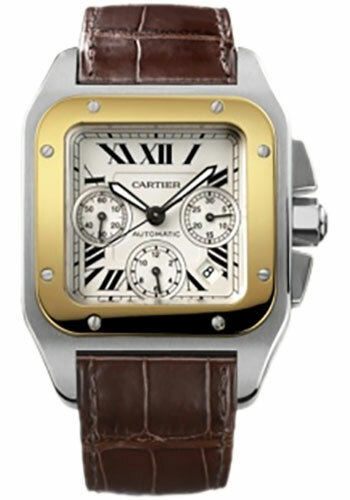 Extra large size, 18K yellow gold case, silver dial, automatic winding mechanical movement with chronograph function, alligator strap with 18K gold deployant buckle. Water resistant to 100 meters (330 feet). Extra large size, 18K pink gold case, 18K pink gold bezel with ADLC coating, black dial with pink transferred Roman numerals, automatic winding Cartier calibre 8630 movement with chronograph function, toile de voile strap with ADLC coated 18K pink gold deployant buckle. Water resistant to 100 meters. Extra large size (46.5mm x 54.9mm) 18K white gold case, transparent back, slate grey galvanic guilloché openworked dial, manual winding calibre 9452 MC movement with flying tourbillon complication, seconds indicated by C-shaped tourbillon cage, alligator strap with 18K gold double deployant buckle. Water resistant to 30 meters. Extra large size (46.5mm x 54.9mm) palladium case, transparent back, Roman numerals dial, manual winding calibre 9611 MC movement, alligator strap with palladium deployant buckle. Water resistant to 30 meters. Extra large size (46.5mm x 54.9mm) 18K pink gold case, transparent back, slate grey galvanic guilloché openworked dial, manual winding calibre 9452 MC movement with flying tourbillon complication, seconds indicated by C-shaped tourbillon cage, alligator strap with 18K gold double deployant buckle. Water resistant to 30 meters.